Indeed, Monk suffered several periods of inactivity due to shortage of work during his career, and it testament to his dedication and belief in what he was doing that he pursued his music and left us a truly marvellous legacy of recorded work and compositions that have been revered by several generations of jazz musicians. From the classic recordings of the forties (The Genius of Modern Music, Volumes 1 & 2), and the fifties (Brilliant Corners, Monk's Music and any of the Riverside Trios) it is obvious to see that there is a rich and varied discography that will be listened to and enjoyed for for many years to come. In celebrating the centenary of his birth,Julian Nicholas gives a synopsis of Monks' recorded output between 1947 and 1961, while Euan Dixon and Jack Kenny look at some of his later recordings for Columbia and the Italian Black Saint imprint. 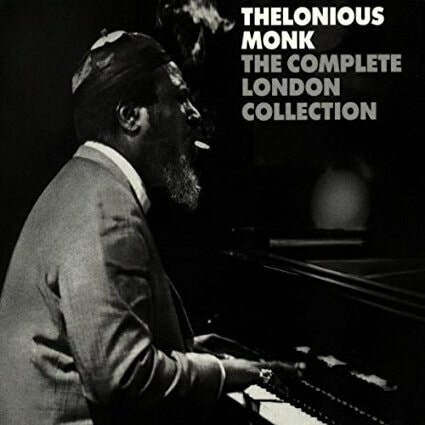 There simply can’t be anything new to say about Monk’s output from 1947 – 1961. Or could there be? We’re talking about the Blue Note, Prestige, Riverside progression, here…. Prompted as much by the vagaries of the day, as much as the desires of record-savvy guides to make Monk more sellable (like Coltrane’s ‘Ballads’), this progression is characterized by two over-arching contradictions. There is a pure joy and major enticement in hearing the range of bassists and drummers of the period in these recording, sign-posting as they do the consequent alignments to follow, such as Wilbur Ware and Sonny Rollins (a huge factor in the Elvin Jones-underpinned Village Vanguard sessions), or Paul Chambers and Max Roach, once of a two-off! Add to this a strangely auspicious presence of Coleman Hawkins at each end, and you’ve got yourself some of the most consistently compelling jazz recordings ever made by anyone. 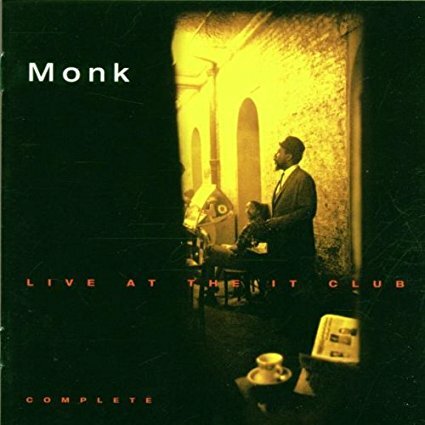 There aren’t any weak moments in Monk’s oeuvre whilst you engage in his music as a search in progress. Look at the development of Sonny Rollins over this period on these recordings. Look at the inclusion of Coltrane, and the often-referenced Monk-matrix’s effect upon him. Take the simple but growing development of arrangement strategies in the 3- or 4-horn line-ups, intertwined with Monk’s mid-range compositional melodic counterpoint. Take the atavism of Hawkins presence with Rollins and Coltrane, the generational quirks of Cootie Williams from Ellington’s band being the co-writer of perhaps the greatest ‘original standard’ of them all, ‘Round Midnight’, and it’s performance by among many, Gerry Mulligan, and the presence of Gigi Gryce in several of the ensembles. But it is always Monk’s playing that is the main subject for me. His bristling self-brinksmanship of real-time thought processes – the level of engaged creative phrase-making – and the constant knocking at the door of the great musical mystery: just how does improvisation relate to the composition? There are some highlights in the ensemble brilliance: ‘Brilliant Corners’ is an impossibly ambitious album in some respects, and benefits from Max Roach settling the advanced creative core of the music, where Art Blakey may have standardized it. Even Sonny Rollins, however irrepressibly independent is his instinct, sounds inspired to fight for the team. Coltrane is ‘starred’ in name, but not nature – playing, as he does, the process, rather than the product, participating in the search rather than celebrating any rich wealth of findings – leaving that privilege to us. Thelonious Monk (piano) Charlie Rouse (tenor sax) Larry Gales (bass) Ben Riley (drums) Recorded in performance at the `It` Club, Los Angeles, California, October 31st and November 1st 1964. Critical opinion has it that with his move to Columbia records in 1962, Thelonious Monk left the avant-garde fringes and entered the mainstream of jazz. He was certainly well advanced in the process of becoming a revered establishment figure with his portrait having appeared on the cover of Time Magazine, his book of compositions a widely utilised part of the standard jazz repertoire turning up regularly on everyone and everybody’s recordings. Furthermore, putting artistic considerations aside, the new label greatly enhanced his visibility from a marketing and distribution point of view. Columbia after all was the label of Miles Davis and Dave Brubeck, top selling jazz stars of the day. It is debatable whether his move to Columbia represents the mellowing of Monk but he certainly sounds like an artist comfortable in his own skin indulging in a more avuncular interplay with his new band than is found on some of the recordings he made with his `big name` contemporaries at Blue Note and Riverside records where his comping, rests and displaced intervals could sound almost subversive. In this beautifully captured live recording the exchanges between himself and Rouse, his longest serving colleague, then in the sixth year of what was to become an 11-year tenure, have a warmth and humour borne of a confident familiarity. Gales and Riley were more recent recruits but are completely in tune with Monk’s musical vision having met up whilst participating in the wonderful Eddie `Lockjaw` Davis and Johnny Griffin tribute session `Lookin’ At Monk ‘which appeared on Riverside. In contrast with the leader their style of playing is fairly conventional which serves to heighten our perception of Monk’s quirky impishness. Rouse is solid and reliable throughout spinning off chorus after chorus of well crafted, logically structured solos whilst the bassist walks steadily through his solos – reproduced in their entirety in this re-issue- tweaking them here and there with subtle rhythmic changes. Riley’s drumming strengthens the pulse and guarantees the forward momentum and he is given plenty of opportunities to insert clever breaks and fours without ever becoming a bore. The two discs contain ten tracks in total including three tunes omitted from the original release and restoring all to their original length. The playlist predictably features mainly Monk staples, including `Round Midnight`, but there are three songbook standards on the second disc all of which are decorated with Monk’s irreverent embellishments. Of the restored items, ‘Bright Mississippi` comes close to being ranked with the standards being a pretty obvious makeover of `Sweet Georgia Brown ‘whilst an eleven minute `Teo` (a tribute to producer Macero) gives all the opportunity to expound at length. Add to all this the benefit of a bright and immediate recording which captures the detail to perfection and we have a live date that enables us to participate in real time experience that has been preserved for posterity and it is this historical significance factor that made me choose this disc over my other favourite from the Columbia era, `Underground` (Columbia Legacy 513359 2), his last small group recording for the label. This studio recording contains what were then four new original compositions and a vocal version of `In Walked Bud` with Jon Hendricks but it is listening to Monk and his men at work that proved the more compelling choice. Alan Bates of Black Lion Records in what must have been one of his best decisions in his career, persuaded Monk and Blakey and McKibbon to record on the day after the final Giants’ concert in London. Three hours were spent on solo pieces and a further three hours on the trio. What emerged was a triumphant Monk retrospective. It has been described as “the last flowering of Monk before the great silence descended”. Monk at this stage of life was not a good verbal communicator. The music on this day communicates a kind of joy and spirit that had not been evident on his work with the Giants. Playing through the discs reminds you vividly of why you love Monk. Humphrey Lyttelton once described the playing of Monk as though a musical genius sat down at the piano for the first time. Above all, it is the sound of surprise, the sound of risk. The compositions are unique as is the improvisation. There is no flash virtuosity here. Each piece has an individual shape completely unlike anything before. There are strange rests and unexpected accents and sonorities. It is all individual rhythms and dissonances. The musical conflicts are pleasing. Many pieces are taken at the medium tempo that Monk loved. There is a real strange beauty in ‘Crepuscule with Nellie’ that is in two versions trio and solo. Art Blakey first recorded with Monk in 1947. Blakey is sensitive when he plays with Monk. In his own groups he can bully and torment the soloists. The drum roll that propels ‘I Mean You’ and the accents that inspire Monk are precise. Take 2 of ‘Hackensack’ has a solo from Blakey. Throughout it is all sympathetic accents. Accounts of what went on at the session are interesting. The strange clicking sounds at the beginning of the sessions were traced to Monk’s nails they needed clipping. Some of the people in the studio made requests to Monk. Some he played, others he ignored. For most of the sessions he sat at the piano in silence. Al McKibbon was very wary of playing pieces that he had never encountered or did had done so only rarely. There were standards played, pieces that absorbed Monk. Probably the most unusual is ‘Loverman’. It was not one that Monk played regularly. Kai Winding used it as his feature with the Giants so it was probably in Monk’s memory. ‘My Melancholy Baby’ is a fine example of Monk recomposing a tune. It is indeed melancholy and a very intense reading. ‘The Man I Love’ is notorious from the sessions with Miles Davis in 1950 when Miles criticised the pianist’s take on this piece. Ethan Iverson notes there are sixty-odd Monk pieces still in the active repertoire, something that cannot be said of any other composer’s work. Some of them are here: ‘Evidence’, ‘Misterioso’, ‘Criss Cross’, ‘Nutty’, ‘Ruby My Dear’, ‘Hackensack’, ‘Trinkle Tinkle’, ‘Little Rootie Tootie’, ‘Crepuscule With Nellie’. ‘Something In Blue’ was new, composed and played at the session; six minutes of fresh blues, teeming with allusions. The most unusual piece is the one that was eventually called (not by Monk) ‘Chordially’. This is Monk at the start of the session testing out the piano, improvising. You can sense his thinking and listen to his thoughts. Michael Cuscuna who issued these sessions on Mosaic says: ‘these are the last recordings of Monk as leader and also amongst his finest pianistically.’ It is a fitting and unique way to bring to a close the most individualistic composing and improvising work in jazz.